Dante had to write a story for school this week about a certain point in time in his life. If they had a picture of the event they were supposed to bring it in. If they did not have a photo of the event they were asked to bring in a photo around the same time frame. The event that Dante wrote about was when he was 3 or 4 and his pj's got caught on the post of his bed and he was hanging in mid air. He remembers me saying "Let me get my camera" but I could not find the photo of that time. That smile and those blonde curls.... 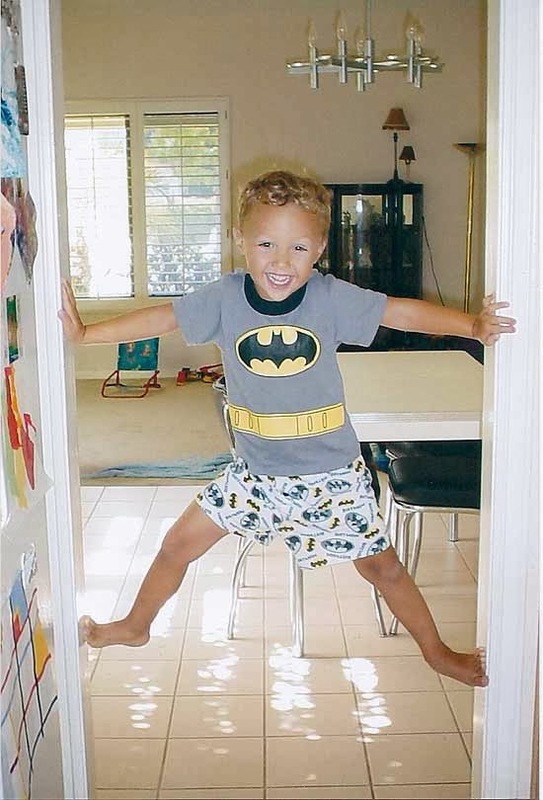 He has loved Spiderman since he was 2, (obviously Batman was not too far behind) and he would climb up the door frames and balance. This photo brought so many good memories back.